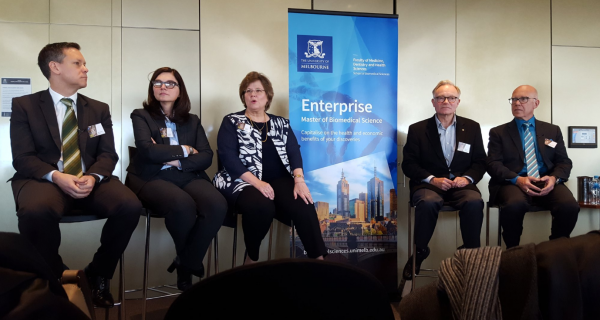 Thank you to all who attended and supported Creating Bioentrepreneurs: Enterprise Specialisation Launch, on Tuesday 17 July. The event was a great success, with a packed house at the Woodward Conference Centre taking part in invigorating discussion around the need and potential for greater innovation and commercialisation within the biomedical sector. Panel discussion on "shaping the future workforce of the biomedical industry." 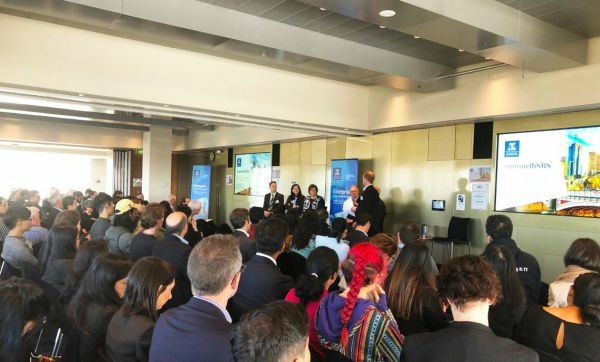 From left: Andrew Wear (Victorian Government), Prof Fabienne Mackay (School of Biomedical Sciences), Dr Lynn Johnson Langer (Johns Hopkins University), Prof Andrew Cuthbertson (CSL Limited), Dr Glenn Begley (BioCurate). Professor Fabienne Mackay (Head, School of Biomedical Sciences) and Associate Professor James Ziogas (Course Coordinator, Master of Biomedical Science) outlined the compelling case for the new Enterprise specialisation, part of the Master of Biomedical Science, which focuses on entrepreneurship and commercialisation within biomedical science. James then introduced international guest speaker Dr Lynn Johnson Langer (Johns Hopkins University, USA), who presented the Johns Hopkins Experience: a leading example of successful graduate biotech education and industry collaboration. A capacity audience at the Woodward Conference Centre. Please click here for video footage from the event. During her visit, Lynn also made time to record a podcast with Dr Andi Horvath, on Eavesdrop on Experts. The full conversation, discussing getting biotech science out of the lab and into market, can be listened to here. For more information about the Master of Biomedical Science, Enterprise Specialisation, please visit the Enterprise website.